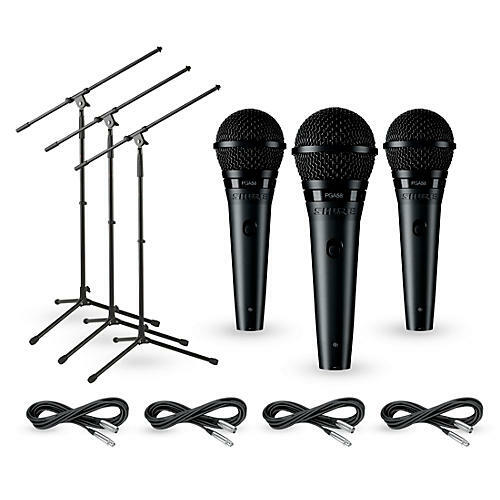 The Shure PGA58 microphone and stand 3-Pack includes one Shure PGA58 Dynamic Vocal Microphone 3-pack, three 20' Lo-Z Microphone cables, and three Tripod Boom Microphone Stands. Engineered to be easy to operate, the Shure PGA58 mic lets you capture the imagination of your audience so you can get your message across. Just as artists, visionaries and social leaders across generations and around the world have done with Shure products for more than 75 years. The Shure PGA58 microphone has a tailored frequency response that is smooth, extended and is tuned specifically for vocal applications The Cardioid polar pattern picks up the most sound from in front of the microphone and some sound from the sides and is less susceptible to feedback. The dynamic cartridge has a simple, rugged coil and handles extreme volume levels without distortion. This Lo-Z Microphone 20' cable is durable, flexible, and black. It features XLR connectors - male plug on one end, female on the other. This Tripod Boom Microphone Stand safely and securely maintains the position you set for your microphone to capture the perfect sound -- in the studio or during live performance. Stand features die-cast metal clutches and non-skid legs that keep the stand where you set it. Boom adjusts from 1" - 23". Height adjusts 40" - 67". Environmental Conditions: This microphone operates over a temperature range of -29 to 57 degrees Celsius (-20 to 135 degrees Fahrenheit), and at a relative humidity of 0 to 95%.